given by Fr. Thomas Dubay, S.M. This Catholic coloring book for adults, teens, and older children has 30 full-page illustrations including religious art, floral designs, and other patterns to color. There are also 22 note cards to color, cut out, and give away. 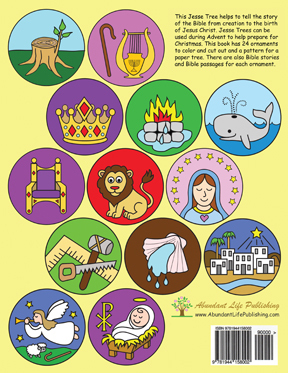 The simpler design of many of the illustrations and the short saint quotes make it easy for kids, busy people, and senior citizens to color. The book also makes a unique gift for grandparents and the elderly and can be used as a quiet activity for the sick, disabled, and those in nursing homes or assisted living as well. 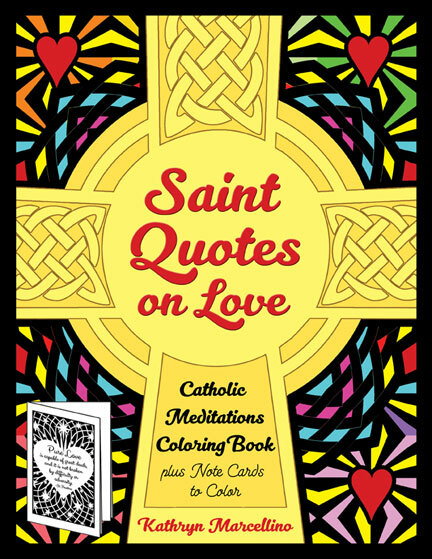 One way to use this book is to reflect on the inspirational quotes from saints and the Bible while coloring inspirational art. The quotes by saints and from the Catholic Bible help set the mood for reflection and meditation on Jesus Christ and his teachings regarding the importance of love. Meditating on the quotations and coloring the pages helps lift the mind to heavenly things. Additional information for each featured quote is provided on the preceding page. Back Cover showing inside coloring pages. 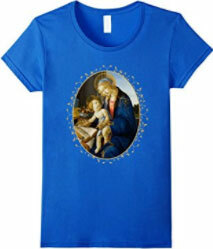 Children nowadays in general learn a lot about our secular world but not as much about our Catholic faith. 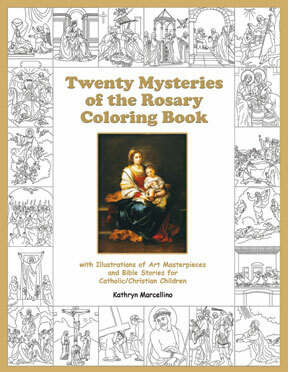 The new Twenty Mysteries of the Rosary Coloring Book by Kathryn Marcellino was created to help children become more familiar with Jesus, Mary and the Rosary as well as becoming more familiar with our Catholic roots through coloring pages based on art masterpieces. 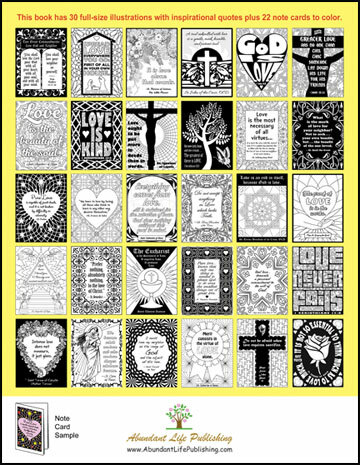 This coloring book has basically the same information and coloring pages as Rosary Meditations:The Gospel in Miniature (below) with black and white interior and larger page size at 8.5 x 11 inches. There are 2 copies of each coloring page. The front cover shows a miniature version of each coloring page inside. The back Cover shows art masterpieces inside that the coloring pages shown on the front cover are inspired by. Covers show ornament designs inside. 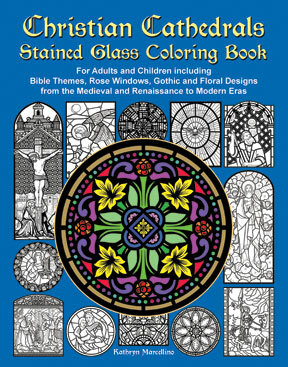 Relax and have fun coloring inspirational pictures and designs while becoming acquainted with exquisite stained glass windows from around the world. This coloring book is designed for children, teens, and adults, from kindergarten age to senior citizens. 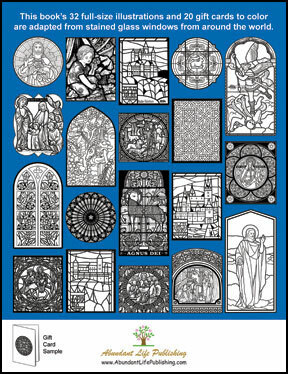 The 32 beautiful full-page illustrations in this book were adapted from actual stained glass windows from some of the world’s most magnificent Catholic and Christian cathedrals and churches dating from the Medieval and Renaissance to the Modern era. They include rose patterns, Gothic and floral designs, and Bible themes. There are also 20 gift cards to color and cut out taken from the same illustrations used for the full-size coloring pages. The illustrations for the card take up 1/4 of the page so that the pages can be cut out and folded into quarters to make a greeting card. Cathedrals are generally designed to be spiritually touching and awe-inspiring with the idea to lift one’s attention to the heavenly things. Sometimes one need only to step inside such splendid churches to feel a wonderful sense of inner peace. Many stained glass windows are also designed to teach about God, Bible stories, and the lives of the saints. As with the great cathedrals, the illustrations in this coloring book are intended to inspire the mind, sooth the heart, and uplift the spirit. Back Cover. Covers show coloring page designs inside. The front cover is shown above. 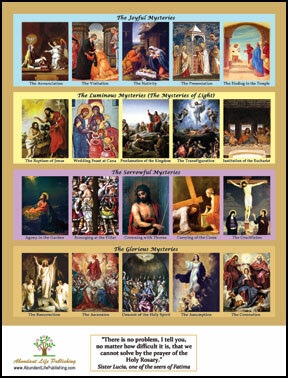 Rosary Meditations: The Gospel in Miniature with Scripture, Art, Coloring Pages, and Bible Stories for Christian/Catholic Kids, Children, Youth, and Adults including How to Pray the Rosary is a book to help children and adults learn the Gospel message of Jesus Christ and to learn to pray the rosary and meditate on the mysteries.The mysteries of the Rosary cover important events in the lives of Jesus and his mother, Mary. The interior of the book is in color and contains art masterpieces and coloring book pages for the 20 mysteries. Each mystery also has a Bible reading, Bible story (or other information), and a short reflection. The reflections are meant to be an encouragement to be a follower of Jesus Christ and to love God and others. There is a section explaining how the Rosary is a Biblical prayer, how to pray the rosary, ideas on how to pray as a family, and a brief overview of the Old Testament as an introduction to understanding the Gospel message. 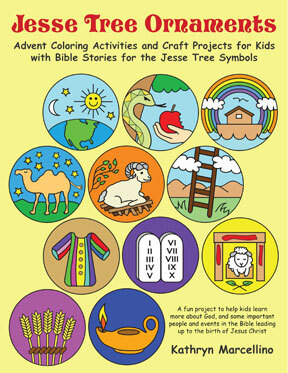 Also included is a short version of the story of Our Lady of Fatima and a coloring page of Jesus Blessing the Children. 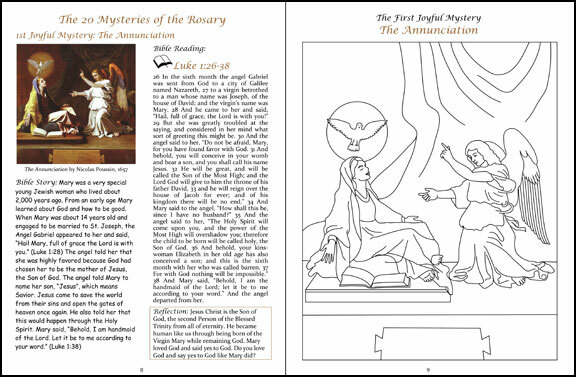 The above image shows 2 side-by-side interior pages with the reflection for the mystery on the left (passage from Scripture and Bible Story) and the coloring page on the right. 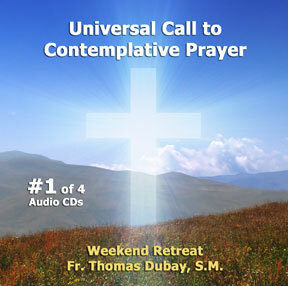  how to pray the rosary in a way to remain receptive to the highest form of prayer which is infused contemplation. This original art extensions coloring book combines drawing and coloring with learning art appreciation and art history. Draw and color in the white area around the art masterpieces with your own designs to extend the 24 full-color art masterpieces by famous artists like Leonardo Da Vinci, Rembrandt, Michelangelo, Raphael, and more! This book was inspired by a type of art project that the author enjoyed back in the 1960s when art classes were a part of the regular curriculum in grammar school. This book focuses on Christian paintings and includes historical background information including the religious significance of the subject matter with some Bible quotations and stories of the saints. Each art extension in this book begins with a color reproduction of a great art masterpiece, which is centered on a larger page. Then by drawing freehand and coloring one extends the painting around the edges to match or accent the artwork. Using one’s imagination and creativity, one can extend the original art in a variety ways. For example, if there is a river in the original painting, it could continue out to border, bend and flow behind hill, or whatever one imagines. As an alternative one could color in highlights or designs in the background. 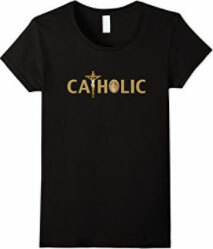 The word "Catholic" with a crucifix and miraculous medal. 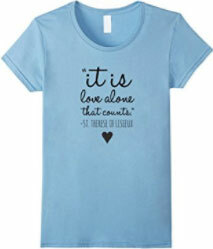 "It is love alone that counts." 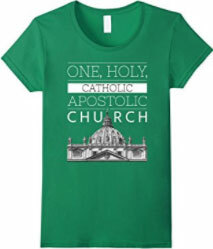 One, Holy, Catholic, Apostolic Church with St. Peter's Basilica. 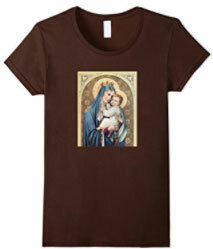 Our Lady of Mount Carmel Shirt available in various colors.